Now, the American Way part of that gets controversial at times, mostly because it fluctuates so much more than the other two. But even as a Canadian I’ll say that if you show me an America that represents the other two, I’d have no real problem tacking that descriptor to Superman (I’m not seeing enough of that America these days). Truth and Justice, though. Those are exactly what I want in my Superman stories. Clark Kent is a journalist. It’s often been said that he does that job so he is among the first to learn about disasters and stuff that may need Superman’s attention. That’s fine, but it ignores the fact that journalism is a vital force in the fight for truth and justice. More than being a vigilante, I’d say. The other answer I’d expect is that Superman represents Hope. This is propagated as text pretty often in more recent stories (the recent Justice League movie is a big example of this). I think that a lot of fans buy into this one. I sure don’t. At a basic level it sounds good. “The world is bleak and full of bad things and it is easy to lose hope, but don’t! Superman is proof that things can change!” but I don’t care for that. It very much places Superman in a space above those he is saving, like some god or a force of nature. One of the big complaints about Superman from people who dislike the character is that Superman can just sweep in and solve everything, and this take on the character caters to exactly that. But I don’t like seeing Superman above those he is saving. Clark is a part of humanity (if not literally human), so when he fights to save the world, he isn’t a benevolent god reaching down to help, he’s a person standing up to help. Clark isn’t hoping for a better world. He’s acting to create a better world. If he is an inspirational figure (and I admit he should be), I don’t want him just to inspire people to sit around hoping Superman shows up. I want him to make humanity rise to action alongside him. If I had to sum up Superman in one word like that, rather than Hope, I’d choose Action. It works on multiple levels. It implies that Clark represents the antithesis of that “Evil triumphs when good men do nothing” scenario, he acts to do good. It implies the exciting scenarios that the franchise should provide in its stories about Clark doing that. And also, Superman first appeared in and continues to appear in Action Comics. I don’t know what Hope Comics is doing, but Action is doing Superman. And vice-versa. Pa Kent: “You’re different from other people. Your unique abilities make you a kind of superman. Because of these great powers, your speed and strength, your x-ray vision and super-sensitive hearing, you have a great responsibility. It’s a pretty simple sci-fi scenario and allows for a lot of social commentary and so on. And that’s the ideal I will be building toward in my future Superman Thoughts. Hopefully they won’t all be as long as this one. I just had a dream where there was a Wishing Chair and whoever sat in it could basically wish for anything they wanted and it would come true. It was basically a chair of omnipotence and it was open to the public. Anyone could use it. Naturally, this caused problems. The world was in flux. Time was constantly being rewritten so that people could correct mistakes from their past. The weather changed to match the mood of whoever was in the chair. It was chaotic. Anyway, eventually I got my turn in the chair and, naturally, I wished for Superman Powers. Things did not go well. Now I don’t know if even my dreams are against me having Superman Powers or, as I kinda assumed at the time, someone had sabotaged it, but anyway, I didn’t get my wish. Instead, for some reason, I became a balding Asian child. I have nothing against balding Asian children, but I don’t consider them Superman. What’s the deal Chair? So anyway, if anyone knows where there’s a real Wishing Chair around, give me a heads up. What’s more, in the course of dreaming I also found a novel just lying on the ground (the details of which now escape me) that looked really cool. I looked forward to reading it and now that I am awake, I never can. Awake and asleep. Both states of extreme disappointment. Go figure. Permalinked: Are Wishing Chairs Real? 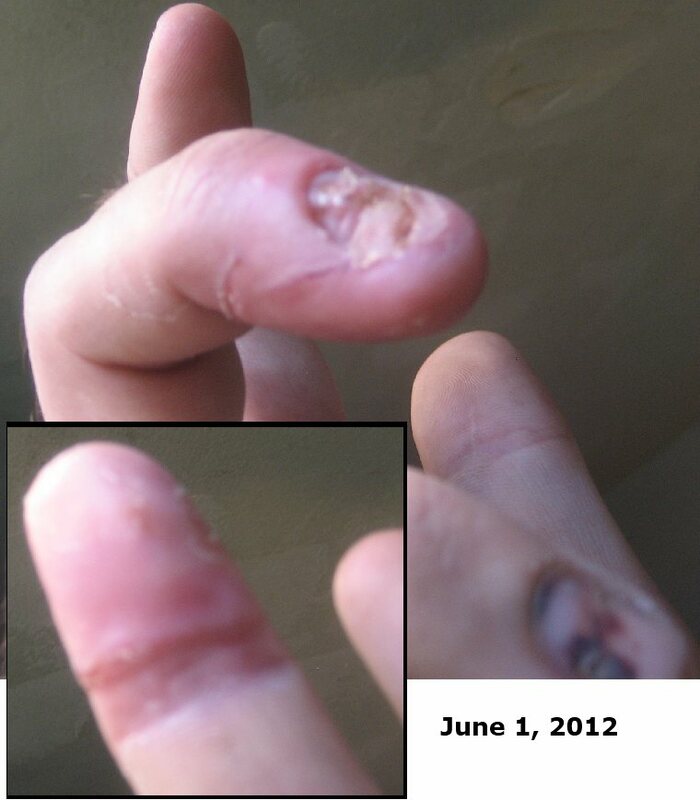 You may recall that I had some finger damage a while back. 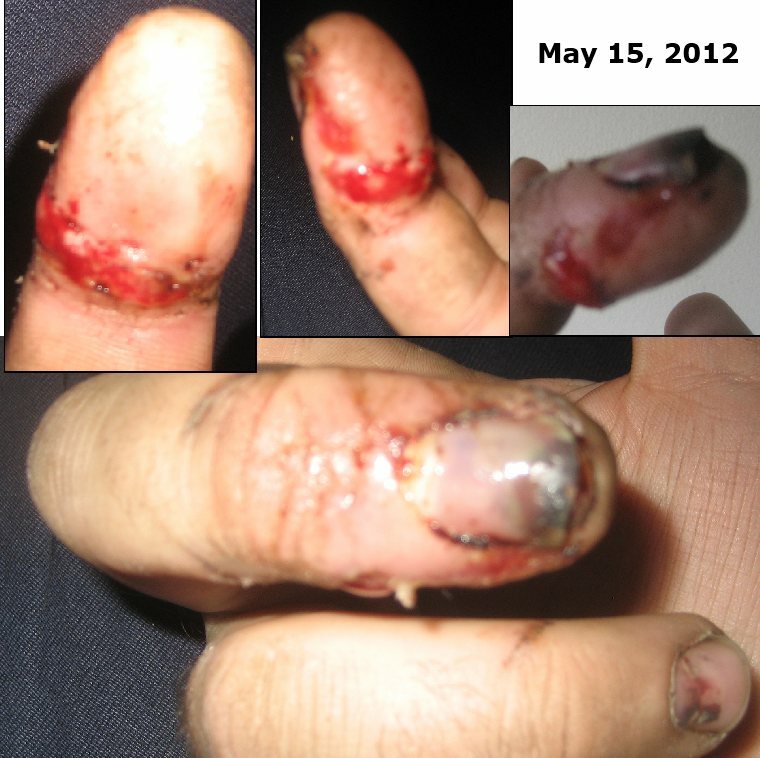 Yesterday was the two week checkup of my finger after the sutures came out on the fifteenth. I’m told that the healing is going quite well. Nobody used the term “superhuman healing factor” but I can read between the lines. Anyway, I’ve taken some more photos. My purpose here is to document PDR after all. Once again, I advise people who are sensitive to what busted-up-fingers may look like to not click on the links. What more can I do? So the first photo shows what I got the day the sutures came out. At this point I had gone nine days without being able to clean the finger, which was less than ideal considering that I had injured it in machinery that was, as ought to be expected, not exactly sterile. But apart from just the filth we also have the dead fingernail sewn back into place to promote the growth of its replacement adding to the overall ugliness of the finger. Add to all of this the actual wound, of course. The sutures were taken out because all the cuts were now closed, but the swelling still had the wounds bulging with redness. The verdict? Obviously this is nowhere near as bad as my previous viewing of the finger, which was when the finger-fill that was hanging out of those wounds was being shoved back in so that they could sew it up, but this finger would not win any beauty contests for fingers. And not just because such contests don’t exist*. The second photo was taken today! Much nicer! The finger has rejoined the rest of its fellows in the routine of regular washing, the dead nail has gone off to wherever it was needed most, and the swelling is down remarkably. At the time off the previous photo it took me four Band-Aids to adequately cover everything. Now I’m down to one. The picture isn’t great, so it can be hard to see the scarring on the underside, but mostly my verdict this time is that this is a finger that looks like a finger. Anyway, though I thought this was to be the last of my visits, they actually want me go back for yet another look-see in six weeks’ time. Whatever, alright. I will point out, though, that the first time that I lost a fingernail in a machine at work (without the addition of a broken bone, admittedly) I didn’t even go back for one checkup, so all of this feels unnecessary to my untrained eyes. But in the end, I would like to thank the doctors at the QEII who spent some time out of their busy days dealing with my dumb injury and they were all nice as they did it. Thanks, people! *If, in fact, beauty contests for fingers do exist, please try to make sure I never find out. Because that would be depressingly stupid. But the post goes on! I wanted to mention, since I brought it up above, the term “Healing factor” annoys me. As a reader of comics and a fan of superheroes, I have come across this term many times in my life and I don’t care for it. I can accept saying that one has an “enhanced healing factor” or, as I did a “superhuman healing factor” but that isn’t the way it is used (As seen in this, frankly not good, Wikipedia page). The ability to heal isn’t a superpower. It’s the degree at which characters like Deadpool or Wolverine do their healing that is actually important, so shouldn’t that degree be a part of the description of their powers? Oh! And since I’m going off on this tangent about superpowers, I might as well bring up some thoughts on Superman. If Superman were facing a villain who had telekinesis or some equivalent ability, would that villain then be able to use his power to make Superman’s bones move? And if so, would the villain then be able to force Superman’s powerful Kryptonian bones through his powerful Kryptonian flesh? I would assume that the strength of each of these would be similar to that of a human bone and flesh, and we know that a bone can pop through that stuff. Now, I like Superman, so don’t consider this me thinking of ways for villains to hurt him. This is me warning him of the potential threat of villains using his own femur to reverse-stab its way out of his body. Watch out Superman! Who are THESE guys too? I have, in the past, put more thought than is necessary into the topic of superheroes who were probably just created, used, and forgotten by their creators. 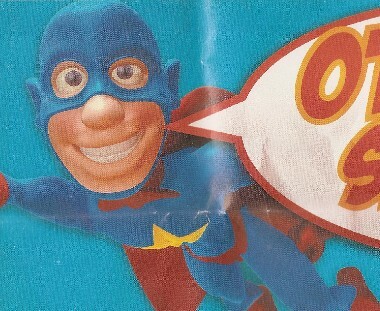 The previous ones were used to decorate a box of tissues, but today’s offering is a couple of superheroes even more mercantile: They’re from ads. Working, as I do, in the industry of putting paper with ads on it into people’s homes, I occasionally pay attention to those ads. 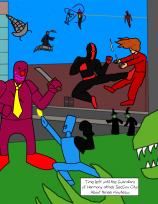 Basically this is only when they have superheroes in them… Anyway, over the couple years since that last post, I’ve bothered to take two of these superhero-using ads home and I will now introduce you all to those heroes. This man is basically Superman. Anyone can see this. This is Superman, but blonde. And he has a different symbol. A fiery symbol. 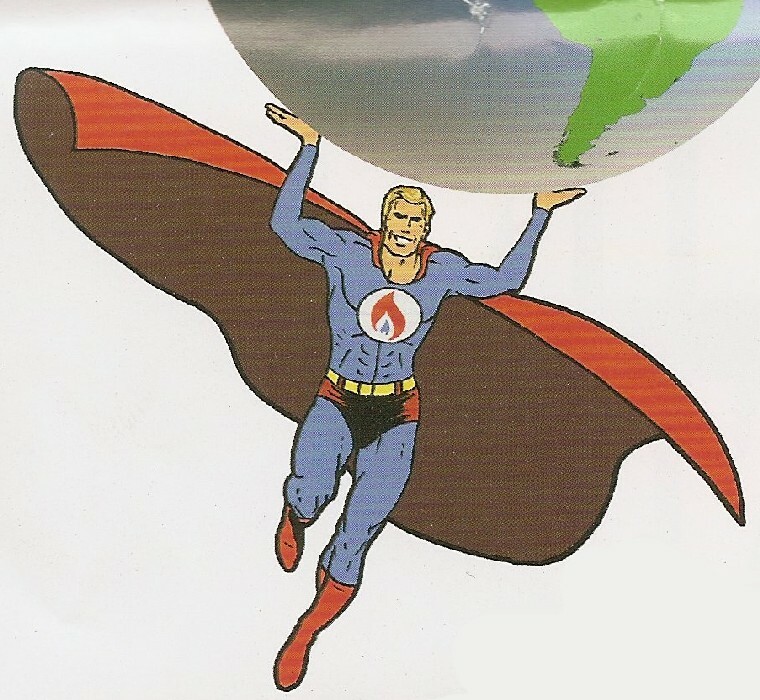 This guy is depicted lifting the world (though this is probably metaphorical. Or at least a model world. I’m ruling out that he is giant. I won’t allow it.) he probably has Superhuman strength on a Superman level. He can also clearly fly. It would be easy to assume that this guy has your basic Superman Powers powerset. Except fire is apparently enough of a recurring for this guy that it is his chest insignia. This implies he has more than just heat vision. This could come in the form of fire-breath replacing the ice breath of superman, but I’m going to assume more. I’m guessing this guy has full pyrokinesis. So what we have here is this guy who can fly, is super strong, can probably go really fast, and can generate and control fires. Sounds like a pretty heavy hitter to me. I get the feeling of a normal man in a costume from this guy. Just some athletic man who wore a costume to try to improve his community by crimefighting. But in a world with guys who can fly and shoot fire, maybe this guy finds it a hard job, as he would. And because of that it isn’t quite so insane that this guy would have to resort to taking advertising jobs. He probably also does exhibition shows at carnivals and public service announcements where he tells kids not to talk to strangers. 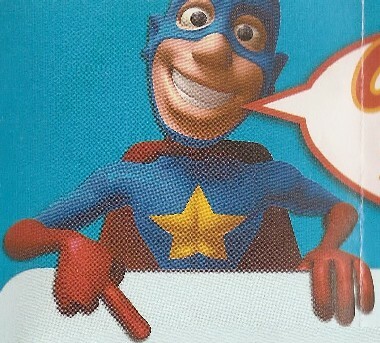 He’s the workaday hero who can’t help much, but does everything he can to help. But I bet there is some drawbacks. He’s bound to feel some resentment, and I doubt he personally enjoys every ad that he has to do. 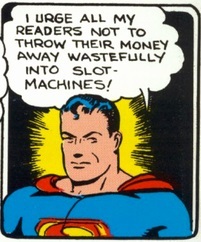 But bills need to be paid, even for a man in a cape. So there we go. Two more superheroes who I am probably the only person who has ever discussed them on the Internet. I win again. Permalinked: Who are THESE guys too?